Summer 2003 | His Kids Too! We have arrived home safely from another wonderful trip to Ukraine! We serve a great and powerful God that blesses us with our every need, and protects us from harm. We were able to serve the orphans, widows, school children, internot children (boarding school), mental patients, Aids children and other hospitalized children, and begin work with 2 additional facilities. distribution of over 2500 lbs. of humanitarian aide: sharing the love of God to orphans, widows, etc., via providing food, medicine, clothing, blankets, toiletries, etc. Goals Met: All goals were met, and even more!!!! Thanks be to God! We were even part of a miracle, which I’ll briefly explain below. Because we want to be the best stewards of the gifts so many of you have provided and funds you have sacrificially donated, below I will give some highlights of the trip followed by a more inclusive list of what was provided to each facility. Click on areas highlighted to view photos, * indicates more photos can be found in the Photo Gallery, Summer 2003. Our family arrived in Kiev June 19, and were off to the train, to the Oblast. I stayed back in Kyiv as our humanitarian shipment was mysteriously being ‘held’ in Simpheropol, and I stayed back in Kyiv to work out the delay. After working through some issues, we were told to ‘come on Monday for pick up’. The shipment contained about 99 % of our Day Camp supplies, and the other 14 boxes were humanitarian aide, along with a wheelchair. The supplies were essential for the success of the Day Camp. to ‘shut’ and all hope seemed to be gone. We had one more possibility, and it was a ‘long shot’. All the way to the office I prayed for this officials heart to be softened to the children of Ukraine and our mission to share Jesus with them. For all the aid that they so desperate needed. I called the team back in Dzerzhinsk, requesting that they pray for this situation. We arrived at the office, and we waited. At 2:20 p.m. Oksana came and gave us the news, in disbelief, ‘the shipment had been released’! I shouted ‘Slova Boga (Praise the Lord in Russian)’, and thanked the Lord for His kindness, mercy and faithfulness. We drove back to the customs officials office with all the release paperwork, and on the way to the shipment, he commented several times that in his history with the customs office (since 1994), they had NEVER released a shipment early, even to a Ukrainian that had shipped something. He was astonished we received the permission. I gladly explained to him, and the others in the car (as we had 2 other officials with us), that it truly was an act by God, a miracle, and that we thank God for this. He commented, ‘well, this doesn’t happen in Ukraine, so it must have been ‘something’. We thanked God for this opportunity to share about the faithfulness of Him to these officials and Oksana, and they all agreed that it was ‘some other power’ that got that official to change his mind about the release date. We loaded the shipment, returned to Dzerzhinsk with the shipment, arriving at 5:15 a.m., unloading and ready for Tuesday’s day camp, and all the teachers were thrilled (as were the children) to have their supplies. The rest of the week of June 23 was just great, and the 2 Bible camps went very well. Children and facility directors were thrilled with the curriculum, Bibles, crafts, songs, and the enthusiasm of the team members. All was well received, and they are eagerly awaiting next years program. After the Bible camp, the team moved on to Kiev for a singing school, but we remained in the Oblast for 9 more days. During this time we were able to accomplish many of the goals and objectives of His Kids, Too!. Life in Ukraine is difficult, and this trip was no exception. We had alot of rain, which allowed the water to run for a total of 6 hours a day, but the mud and dirt were a constant problem. Many days were spent visiting facilities and assess the needs, purchasing items and returning for delivery. Some days were spent delivering the items that were in the shipment that so miraculously was released. 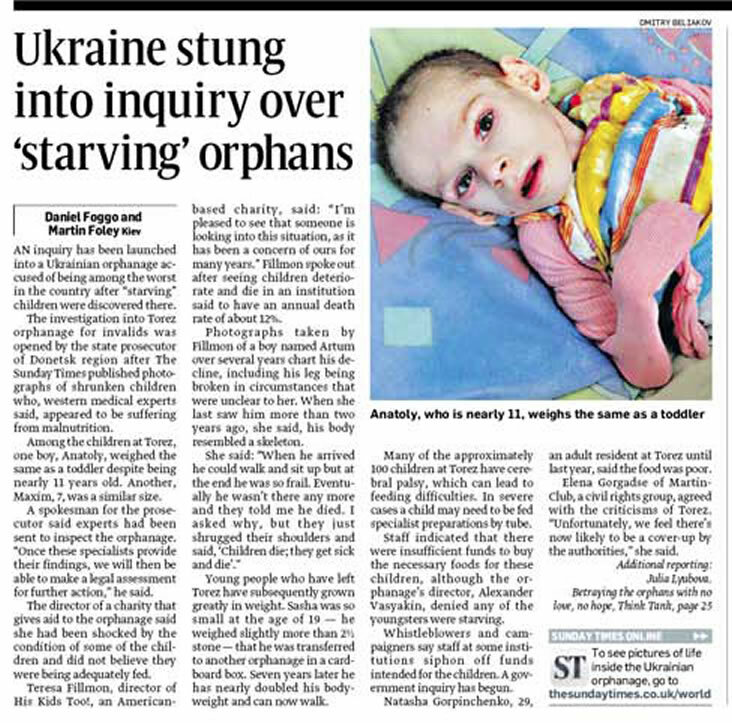 Medical equipment unavailable in Ukraine, but life changing to many precious children. Monday, June 30th was a holiday, and we spent the day sorting 2500 lbs. of aide to be distributed to 8 different facilities. Tuesday we were off to Donetsk to visit Alla’s orphanage, Teremok Orthopedic Hospital, and the Specialized Baby’s Home. The workers, children and director were thrilled to see Alla and her progress. They whisked her away when we arrived, and we didn’t see her again for about an hour. She was very glad to see ‘her friends’, and spoke with many children, and all the workers. We had a special time with the director, and her special care giver, Oksana. We left clothing, shoes, toys, and medicine, for all the children, and some blankets. Thanks to your continued support, this facilities also receives on a monthly basis, diapers and high vitamin juice from His Kids, Too!. At the Teremok Orthopedic Hospital, children received toys, clothing, medicine, and they were the recipient of the wheelchair. Thanks to Whitmyer Biomechanxis, this facility has received 7 chairs and 4 walkers, they were VERY grateful, and it was great to see them using all the items provided. We were then off to the Specialized Baby Home, (Aids Hospital), where the children were asleep. But we met with the director, and provided the facility with homemade quilts, medicine, clothing, and stuffed animals for all the children. Our trip to Donetsk was very special, and a delight to see the facilities using the items His Kids, Too! provides, and also overseeing this usage with good stewardship. Wednesday was off to a new facility, a Internot (Boarding School). This facility, extremely poor, relayed to me, that they had NEVER had an adoption by a foreigner, and only 2, by Ukrainians. The children, though older, are quite nice, and I would encourage those interested in adoption to possibly consider theseand these children. Children were provided with 2 sets of clothing, toothbrushes, soap, shoes, socks, and every child received a stuffed animal; the facility was provided with sport games, toys, soap, and additional supplies for children that will be transferred to the facility in the future. If support is received, we will continue this work, as this facility is in dire need of much help. The director was extremely grateful and amazed at our generosity. We of course, relayed, that we are only the messengers of this aid, and that many, many people in America have provided the funds. Our plans, if funding is provided, is to purchase much needed sheets, pillow cases, towels and shoes to this facility during my October visit. Thursday and Friday were spent visiting the facilities that we assist in our ‘home town’, Dzerzhinsk. The local internot had allowed us to ‘set up shop’ in one of their empty rooms, and this room ‘housed’ all the clothes for the children of their facility and the others in Dzerzhinsk. This made the task of clothing the children less difficult, since we were able to sort and size. We clothed over 300 children at the Boarding School, local orphanage, and a new facility, a Children’s Hospital. Each child received, at least one outfit, if not more, socks, shoes, a toothbrush, soap, a toy, a stuffed animal and a personal gift (for a boy or a girl), all of which YOU provided through your generous giving. The Internot and Orphanage received sport equipment and medicine for all the children. At the hospital we were able to provide a large amount of specialized medical equipment (trachea. equipment, syringes, oxygen tubing, gloves, suture kits, blood pressure kits), OTC medicine, blankets, clothing for all the children, toys, and a stuffed animal for each child. With your support we will continue to help this children’s hospital, as they are in dire need, and the director is very open to receiving assistance. Additionally, we sent clothing to the local mental hospital for their adult patients. Saturday, I went shopping for food, and that afternoon we were able to supply 30 widows with food and toiletries in wonderful canvas bags provided by Florida Children’s Forum. Monday, July 7 was spent clothing some very poor local families. Even after all the donations throughout the weeks, we still had plenty to help others, a reflection of the great ‘fishes and loaves’ story! During the week of July 1st, we had evening Bible studies for the ladies, looking at the lives of Mary and Martha, and then looking at love and forgiveness. Saturday one of our frequent visitors, Angela was baptized into Christ, it was so exciting to see this life changing decision. Additionally, Rich was able to baptize her in our bathtub, because there was no water, in the morning when the water was ‘on’ we had collected it in our bathtub. When our time in Ukraine was over, and we believe that it was time well spent. God had blessed the trip, and were able to meet our goals. Please remember, that each ‘gift’ is given with a laminated card stating that the gift is from the local Church, it’s meeting place and time, and a local contact person, we want to always ‘point people’ in the direction of hearing more about Jesus, and not just receive aide. Below is the list of items purchased and the aid that was distributed to orphans, hospitals, boarding schools, the mental hospital and specialized baby home. Additionally, ‘thank you letters’ from directors, etc. are available for review. toys, and a stuffed animal for each child. The trip was wonderful, productive and successful in meeting our goals. I will return to Ukraine in October for 10 days for humanitarian purposes as well as to continue to serve at the local church. We want to thank you for your continued support through prayers, encouragement and financial gifts to this ministry. Without your help, His Kids, Too! could not be the messengers of your love, care and concern for these people and seeds of Gods love for them could not have been sown. Please feel free to contact us with any questions or comments and may God Bless you as serve Him.